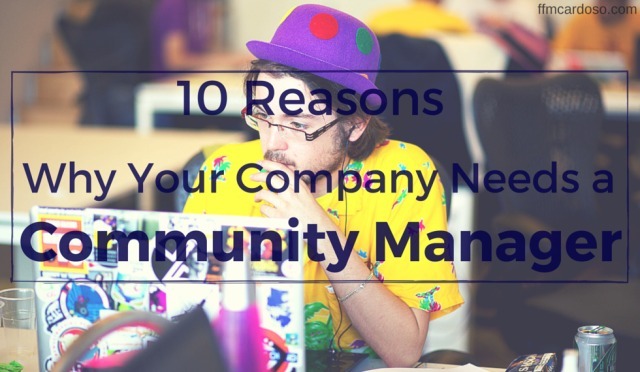 I have put together a list of 10 reasons why you should be considering to hire a Community Manger for your company today! If one doesn’t know your brand or product he or she will do two things: type or company’s name on Google see your website and jump into your social networks. So, think about this… If the message on your Social Networks is messy, unpleasant and unclear, what do you think people will take from your company? They will most definitely not be willing to trust or buy from you. Image counts too much nowadays so make sure you know who’s taking care of it on Social Media. This is an example of a well managed Facebook page where image is well taken care of. You can see a great cover picture, a well written short description and a Mission. Easy and pleasent for the user. One of the thing why customers use Social Media is to connect easily with the brands they like because it’s much easier, informal and quicker than an email or phone and because in many cases the replies are much faster. So you need to be aware that you must have someone ready to reply to any comment, request or query as fast as possible. You can’t leave your customers hanging on forever till you have time in the end of the day to have a look on Twitter or Facebook. Social Networks are in many cases the first point of contact between customers and brands and that’s why some major brands start to have a 24/7 Community Managers on their offices. 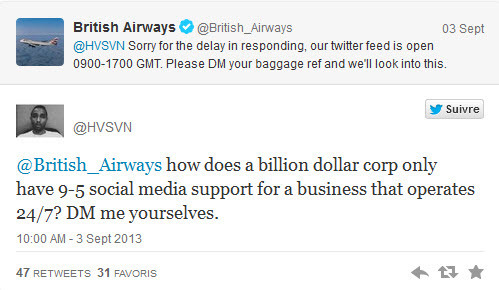 Airlines seem to be putting a lot of effort on their Social Media as they know how important is to their customers to have a fast reply. 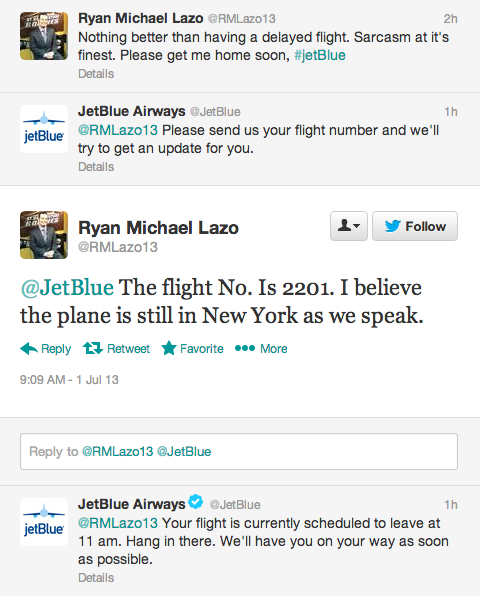 Twitter is a great channel to get in touch with them and Jet Blue Airways is doing it properly. One of the most time consumings takes for someone that works with social media is to find interesting content to share with their audience. This can be an excruciating task for someone without the proper tools or know-how. Guy Kawasaki and Peg Fitzpatrick on their highly recommend book The Art of Social Media call it Feeding the Monster. It’s in fact a great expression and especially if you are using Twitter you know that a lot of content is needed to be published if you want to play a relevant role on this platform. Your company will need someone that have the time and the grasp of tools like Feedly, Buffer, Buzzsumo and Content Gems to find and share valuable content. An example how time consuming Twitter can be. Alfredo Vela, one of the Social Media influencers in Spain, tweets on average 175 times! This means that Alfredo needs to find a lot of content to publish but also has know-how on social media automation. Until you find your sources and routines, this task can be extremely hard and won’t be done in just 10 minutes. This world moves fast. really fast. Everyday new tools are created and need to be tested, each network adds a new service or changes something and a new platform needs to be tested. Your company needs to be knowing what is being done on social media not to face the risk of being outdated. So, you need someone that is always checking and reading what is being invented and done. Here´s a good example of 4 Facebook Marketing “Tricks” That are Outdated and Annoying. One thing that is fundamental in Social Media is to find your audience. If you have a big brand, they will find you, but if you are small and need to find your niche this is something you need to do it yourself. It takes a time and patience, you need to read, listen and pay attention to what people say, comment and share on Social Media to be effective on it. Then again, you need tools, time and resources. I recommend this read if you want to adventure on knowing how to reach your audience. Having bad comments or bad reviews on Social Media is any business owner biggest fear. I even heard business owners saying that didn’t want to take their business to Social Media since they didn’t won´t to take the risk of their company to face bad comments. You will need to take this bull by the horns, bad comments, bad reviews and trolls will be always be around and we just need to know how to deal with it. You may think that the person only needs to have basic common sense, but it takes a bit more than that. If you have a crisis going on on your Twitter, you need to make sure you have a professional dealing with it, and sometimes even during out of office hours. 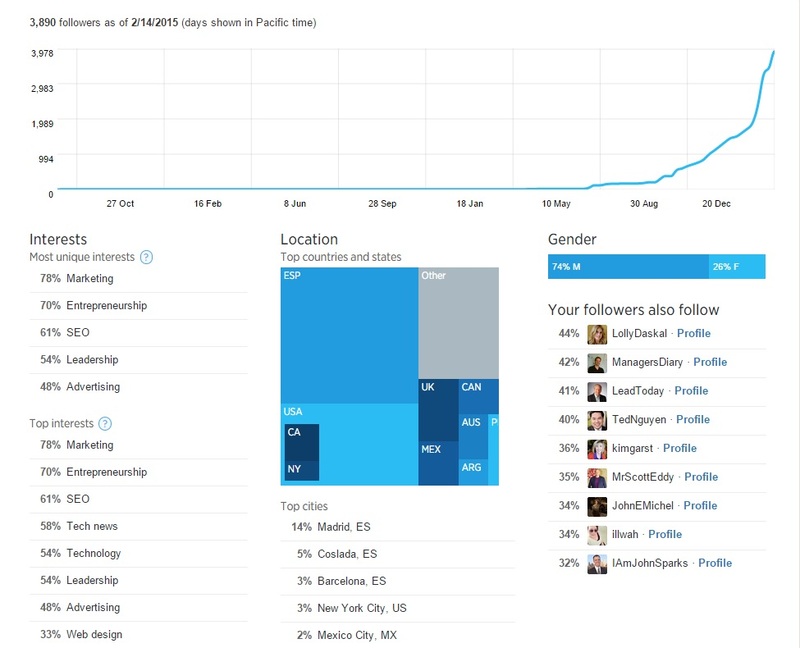 The pictures shows some of the stats that can be found on Twitter analytics. It´s fundamental to know some of the numbers to understand better your audience and what to post. Before bringing your company to Social Media you need to have a strategy in order that your presence can effective and productive. An experience Community Manager will be able to create one and to make sure there´s a plan for your company. Having someone that creates a strategy can save you a lot a money and time and making sure that Social Media can be in fact useful for your business. Hootsuite has a fantastic blueprint on how to create a strategy from scratch on this article. If you been using Social Media or reading about it you have came across with the this. Social Media is becoming lesser free. You have to start to pay to play, especially on Facebook after the recent changes on their algorithm makes it really difficult to reach most of your followers. This basically means that you need to start paying to get noticed and if you want your ads optimized as much as possible you need to know what you´re doing. This is another very important task for your future Community Manager. Managing Social Media evolves a lot of time a set of skills that unless your are trained and experience you wont have it. If your company has an employee managing Social Media that combines it with other tasks, it wont work for sure. All of the reasons that I mentioned above will take much time and effort and unless you have someone committed 100% to it it´s better to pull your company out of Social Media. The position of Community Manager or Social Media Manager is sometimes quite underrated and I hear people saying that any marketing intern that can fool around with Facebook and Twitter can do this job for a company. Other companies may assume that someone can do it at partial time, but more and more, this job is becoming vital for any company´s marketing and should started to be taken way more serious that it is right now. What are you thoughts on this? Does your company have a Community Manager? How´s your company doing on Social Media? I would love to know what you have to say about this. Enhorabuena Francisco, es un post muy completo, para mi uno de los mejores que has escrito, con buen contenido, cantidad y principalmente calidad. Creo que son 10 razones muy buenas para describir por que las empresas necesitan un Community Manager, y espero que algunas de ellas vean este post y se animen a ello. Me parece muy interesante también los 3 cracks de Marketing online que estás leyendo, pues con ellos puedes aprender mucho y eso creo que ya se nota en este post..
Venga un saludo y anima te a escribir mas articulos como este!